Meet Olivia, not quite the Grinch but certainly indifferent towards Christmas after she’s been raised in a family that escape to sunnier climes during the festive period rather than have the traditional Christmas at home. As Christmas approaches this year, single Olivia is more than happy and actually quite excited about spending the holiday period alone, at home, in her pyjamas, eating whatever she wants and sleeping until whenever she wants. Liv just needs to get the annual work conference in New York out of the way first, then the sofa is all hers. But when her boss breaks her leg Liv finds herself in charge of representing the company with the aim of helping them go international...pressure! Can she do it? And will the snow storm hitting the UK affect Liv’s Christmas plans with her sofa? 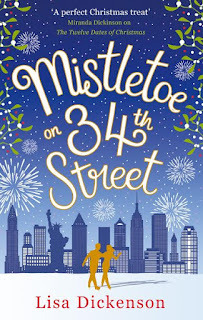 Mistletoe on 34th Street is a very witty novel from the onset and I immediately felt comfortable with Lisa’s writing style which was quirky and engaging. I love Christmas and perhaps the build-up is even more exciting than the actual period itself. Although Liv isn’t keen on Christmas, I felt the book was Christmassy throughout. Without wanting to give too much away, the Christmas spirit certainly builds throughout the novel in a lovely way. 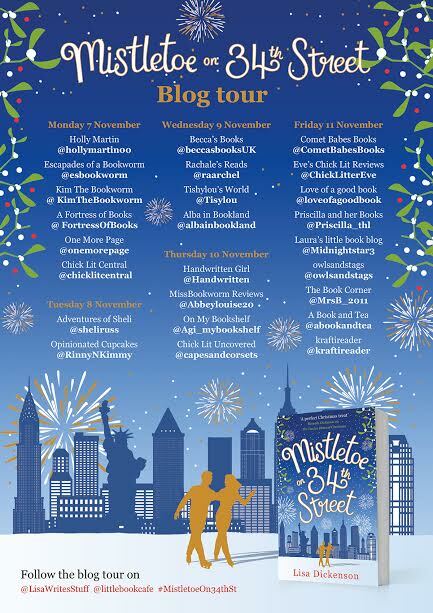 What to say about the setting; well I’ve read a fair few books set in New York at Christmas time but to me this book just gets it so right, I felt like I was there being shown the sights myself, not just the obvious places too, it felt natural to the story too. I also loved the film and cultural references which were plentiful, even if I didn’t recognise every one. There’s a great set of characters in the novel. Essentially Liv and her core colleagues and associates all attend the conference and find themselves stuck in New York. From the colleague who is pining for her boyfriend to the pair who are not so secretly together, they all added something, and I loved the scenes set in the apartment. I felt like a fly on the wall. They go on a journey together even if it’s a reluctant journey. Liv is also tested to see if her defences, which she’s had raised since her last relationship ended badly, can be broken down, and will it be by an old friend on an exciting stranger? Cue several exciting and impromptu dates in New York whilst waiting for a flight home. I loved discovering New York with fresh eyes like Olivia, she’s no stranger to New York, but she’s never really seen it and felt it before. A great story and a great setting. 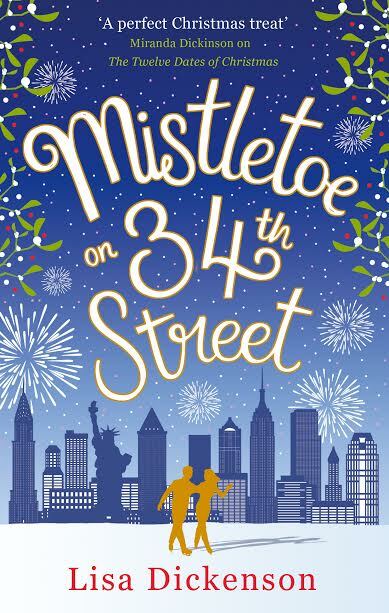 If you need at least one Christmassy novel fix this year, I recommend this one. Be warned: you might just want to buy a ticket to New York afterwards.